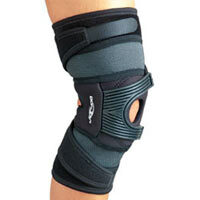 The Tru-Pull PF Knee brace is indicated for patella dislocation and/or subluxation. For symptomatic pain relief of patellofemoral dysfunction including subluxation/dislocation, mal-tracking and patellar tendonitis. It is comprised of neoprene and plastic/rubber straps.